Due to the extremely alarming rise of Donald Trump, the American public is once again questioning the political beliefs and actions of lower-class whites. Often considered to be voting against their own self-interests by supporting elite white politicians, the nation’s poorest whites are generally stereotyped as uneducated, uncouth fools whose beliefs are dictated by an insidious form of racism. Yet poor white support for this aristocratic class has not always been so unwavering. Indeed, during the late antebellum period in the plantation Deep South, class tensions between whites were rife; and as conflicting views over slavery mounted, a deep distrust – and at times, hatred – divided the rich and the impoverished. By simply acknowledging that whites have not always aligned in solidarity against black Americans, several persistent falsities regarding Southern history are revealed. Perhaps the most important myth to dismantle, however, is the myth of white unity over slavery. Poor whites consistently supported slaveholder policies, and even fought for the Confederacy, the argument goes, because they greatly admired the slaveholders and aspired to own slaves themselves. To be sure, there was certainly near-universal consensus among Southern whites regarding racism, but support for slavery varied significantly, especially among members of lower economic classes. Instead, the vast majority of poor whites recognized the near-impossibility of eventually owning slaves. One of the main reasons this myth continues unchallenged is due to the disconnect between historians and economists. Especially over the last decade or so economists have produced some incredibly significant work concerning the nineteenth century South, yet their work goes virtually unheeded by many in the historical profession. Historian Joseph Glatthaar’s research had previously confirmed the strong ties between Confederate volunteers and their involvement in slavery. In 1861, he found, almost half of all the South’s enlistees “either lived with slaveholders or were slave owners themselves.” And the non-slaveholding volunteers sold crops to, worked for, or rented land from slave owners – a direct connection to slavery was unambiguously clear. Writing more than fifty years before Glatthaar, Hugh Bailey examined the antithesis of this slavery-induced patriotism. Studying Confederate disloyalty in Alabama, he contended that even in the Deep South, non-slaveholders held strong Unionist and anti-Confederate sympathies. “It has long been recognized that disloyalty to the Confederacy became widespread” in much of northern Alabama, he penned, an area which “remained a cancer in the side of the Confederacy for the remainder of the war.” Victoria Bynum and a few other historians have made similar arguments about the deep divide among whites over slavery and secession. Having these scholars’ theories confirmed with economic data is more important than ever in this current era of non-factual “truths” and propagandistic lies. Still, the most important recent paper by economists concerning the nineteenth century South is probably Samuel Williamson and Louis Cain’s “Measuring Slavery in 2011 Dollars” – a brilliant piece of work that many historians of American slavery tend to overlook. By truly explaining Southern wealth distribution and the price of slaves, these economists help dispel the misconception that every non-slaveholder, no matter how impoverished, believed that one day they could enter the ranks of the master class. In short, Williamson and Cain established that by the later antebellum period, purchasing a slave was far outside of the realm of possibilities for poorer whites. By using different measures of economic value, they arrived at a much more accurate analysis of the capital it required to become a slaveholder. Arguing that both economic status and economic power influenced the cost of slaves, Williamson and Cain wrote that “Even if they have not been elected to power, the wealthy often have disproportionate influence on those who do…[and] Slaveholders as a group had considerable economic power.” Therefore, while the average “real price” of a slave in 1860 was $20,000 in modern terms, that number is not an accurate indicator of how much capital a non-slaveholder needed to enter into the ranks of the slaveholding oligarchy. By accepting that the idea of white unity over black slavery and the Confederacy is nothing more than myth, important nuance is added to the narrative of Southern history. While the consequences of slavery were certainly far more severe and sustained for black Americans, it is important to recognize that the socio-economic repercussions of slavery also greatly affected lower-class whites. The work of economists continues to demonstrate the extent to which racially-based slavery left the entire region impoverished, and historians will be well-served to incorporate that research into their own scholarship. Indeed, just a few years ago economist Rodrigo Soares and his team found that the “historical use of slavery is significantly correlated with current levels of inequality,” convincingly demonstrating that even today slavery’s legacy is undeniably visible in the economic circumstances – and thus the material well-being – of all non-elite southerners, both black and white. Keri Leigh Merritt works as an independent scholar in Atlanta, Georgia. Her research focuses on race and class in U.S. history. 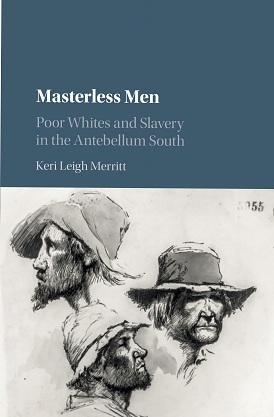 Her first book, Masterless Men: Poor Whites and Slavery in the Antebellum South, was published by Cambridge University Press in 2017. She has also co-edited a book on southern labor history with Matthew Hild (Reviving Southern Labor History: Race, Class, and Power, forthcoming), and is currently conducting research for two additional books. One is on radical black resistance during the Reconstruction era, while the second examines the changing role of law enforcement in the mid-nineteenth century South. It will ultimately link the rise of professional police forces in the Deep South to the end of slavery. Joseph T. Glatthaar, General Lee’s Army: From Victory to Defeat (New York: The Free Press, 2008), 20. Hugh C. Bailey, “Disloyalty in Early Confederate Alabama,” Journal of Southern History 23, No. 4 (Nov. 1957): 522-523; Victoria E. Bynum, The Long Shadow of the Civil War: Southern Dissent and its Legacies (Chapel Hill: North Carolina, 2010). Samuel H. Williamson and Louis P. Cain. “Measuring Slavery in 2011 Dollars.” Paper on MeasuringWorth.com. What an excellent article. I have been maintaining for decades that the fundamental basis for slavery was obviously economic, not social, and that the poor-whites in the Sputh never had the slightest chance to get a job to improve their circumstances in a totally agrarian economy, where all the available farm jobs were taken up by wage-free slaves. Can you imagine what a power-house economy the South would have had if the very wealthy plantation owners had been required to fill 4 million pay envelops every single week? Combining that with the incessant demand in Europe to buy all the raw cotton the South could produce, would have made the South into an economic engine seldom seen in the world. A good article. Of course historians have always understood that non-slave-owning areas were low in support for the C.S.A. Just look at WV, to say nothing of E TN, W NC, N AL including Winston County, many counties in MS including famously Jones, etc. At the same time, Thorstein Veblen wrote an entire book about how the ideas of the upper class typically filter down and permeate the lower classes. A guy named Karl Marx said something about false consciousness, as well. That’s one reason why the secession movement talked so much about straight white supremacy. (See, inter many alia, Henry Benning’s “Address to the Virginia State Convention,” in THE CONFEDERATE AND NEO-CONFEDERATE READER (and elsewhere). Even if slaves were more expensive than previously thought, the ability of people to identify with the rich should not be underestimated. Consider the extensive working class support today for an end to the inheritance tax. IF they win the lottery and die rich, they want to pass it ll down to their heirs, even tho they have NOT won the lottery. Sigh. The power lay with the wealthy elite, who controlled the economy. Historians have long acknowledged that the economics of slavery was the basis for the division of the country. But the racism cannot be divorced from the fact of slavery’s existence and that the enslaved were only in that condition because of their skin. The elites who held slaves ‘could not afford’ to treat them well and pay them a proper wage, hence their claims of states’ rights, etc. It’s always been about the money but at the expense of the lives of the enslaved .